Following the historic Trump-Kim summit in Seoul, and a significant warming of relations between the two Koreas, anti-US propaganda posters and merchandise appears to have been removed from the shelves of North Korean shops. Anti-american propaganda — that was extremely widespread across North Korea — has begun to disappear, following recent diplomatic developments between Pyongyang, Seoul and Washington, say North Korean media sources, tour guides and people interviewed inside the country. The demonization of the US was one a key pillar in North Korean ideology and nationalistic propaganda. The US and the western world previously were depicted as despicable, bloodthirsty and otherwise ugly, with cleancut and healthy DPRK Communist soldiers working heartily to smash its adversaries to smithereens. However, this part of the government's visible expression is now gone, as anti-American merchandise in demilitarized zone (DMZ) tourist shops is no longer available, according to a report by the Asian Correspondent. — Amee Vanderpool (@girlsreallyrule) 9 июня 2018 г. ​Many murals on buildings depicting the many atrocities of the West, are now reportedly being replaced to focus on positive ideas such as productivity, reunification of the two Koreas and the next five-year budget plan. Simon Cockerell, a Koryo Tours general manager, told NK News on Wednesday that his company "had tour groups at [the Peace Museum in the village of] Panmunjom both last week and this morning, both of whom reported the absence of anti-American propaganda material." Cockerell said that given how steadfastly anti-American the DPRK has been, the removal of anti-US propaganda "may be the start of a real softening of rhetoric." Rowan Beard, a guide with Young Pioneer Tours also told NK News that the anti-American postcards, posters, and stamps were no longer for sale, the Asian Correspondent reports. North Korean propaganda changes its tune! — Breaking News (@Breakin67275821) 22 июня 2018 г. ​"All the usual spots where I saw the anti-American posters along Kim Il Sung Square have been removed," he said, cited by NK News. Apart from anti-US materials, posters that advertise Pyongyang's nuclear missile prowess have also being removed. Pyongyang has instead ordered a series of posters dedicated to the April 27 declaration between the two Koreas, the largest diplomatic breakthrough on the Peninsula in years. 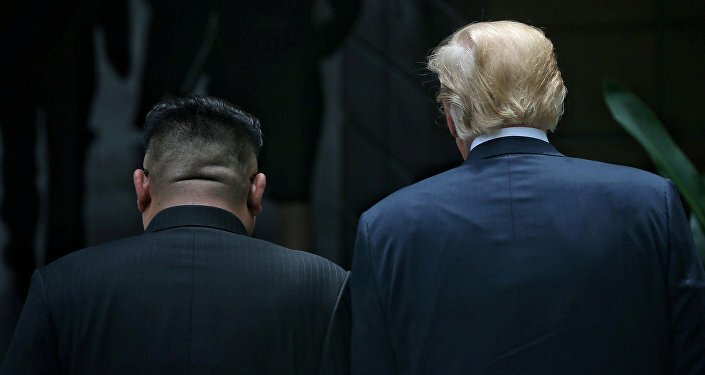 Following the historic meeting between US President Donald Trump and North Korean Supreme Leader Kim Jong-Un, the two heads of state refrained from launching insults at each other. The United States also cancelled major military drills with South Korea, and Pyongyang expressed its "unwavering commitment" to denuclearization of the Peninsula. On June 25, North Korea will commemorate the 68th anniversary of the beginning of the Korean war. Usually, this day is market by massive anti-US mass rallies and even the release of new post stamps with anti-US imagery. NK News observed that how Pyongyang handles the upcoming event will be indicative of DPRK diplomatic and internal policy developments.